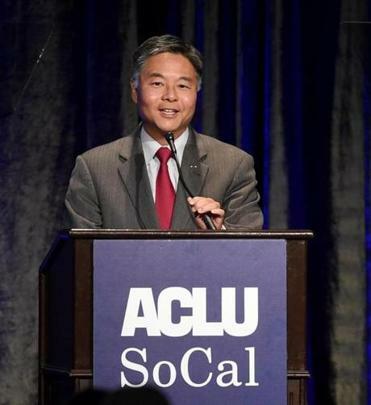 US Representative Ted Lieu speaks at the ACLU&apos;s Annual Bill of Rights Dinner in Beverly Hills, Calif., in November. In a recent interview on CNN, Representative Ted Lieu, a California Democrat, was asked whether members of Congress should be doing more to stifle false or hateful speech on the Internet’s big social-media platforms. Lieu’s response: While public officials may dislike what shows up online, the Constitution prohibits censorship. Conservatives have long complained about the left’s willingness to act as thought police, so you’d have thought Lieu’s words would be applauded on the right. It’s not enough for the media to stand by itself to defend and protect press rights. It needs the support of other powerful institutions. Regrettably, such egregious mischaracterizing of Lieu’s words is what passes for reasoned commentary on much of the right — which now cares less about making principled and persuasive arguments than it does about scoring points against the opposite team. I write as a lifelong conservative, who came to political maturity in the Reagan era, when even liberal intellectuals like Daniel Patrick Moynihan praised the GOP as a “party of ideas .” It pains me that so much of what passes for political analysis among conservatives is now as shallow and mean as the cheap shots in which the worst liberals have long specialized. What makes it all the more contemptible in this case is that Lieu was making a fundamentally conservative point: The Constitution protects us from ourselves, and from elected leaders who are always tempted to extend their reach too far. “The urge to save humanity is almost always only a false-face for the urge to rule it,” H.L. Mencken wrote. Politicians who acknowledge as much should be extolled, not trashed. To answer Carlson’s scornful question, yes, Lieu does sound “like someone who is deeply committed to a free society and its benefits.” I disagree with most of Lieu’s policy prescriptions, but I appreciate that even in the face of outrageous distortions in the press and on social media, even when confronted with reprehensible speech, he respects the limits set by the First Amendment. This column is adapted from the current issue of Arguable, Jeff Jacoby’s free weekly newsletter. Jeff Jacoby can be reached at jacoby@globe.com. Follow him on Twitter@jeff_jacoby.